An evening of country fiddling at WBAI's Free Music Store, broadcast live on March 11, 1972. Part 2 of this recording features Bill Garbus and Allan Block performing an Irish fiddle tune, Corn rigs, and Hard to love (with Kenny Kosek, banjo). Benjamin Franklin "Tex" Logan, Jr. and the Apple Country String Band perform Katy Hill, Rabbit where's your mammy, Fire on the mountain, Cotton-eyed Joe. Intermission. Tom Whitmore introduces Doug Tuckman from the Bluegrass Club, who delivers a short notice, and Bill Vernon who emcees the rest of the evening. Tex Logan and the Apple Country String Band return to the stage to perform Roanoke, Footprints in the snow, and Train whistle blues. Allan Block and Bill Garbus perform Angeline the baker and Wake up Susie. Tex Logan and the Apple County String Band perform Shady Grove. 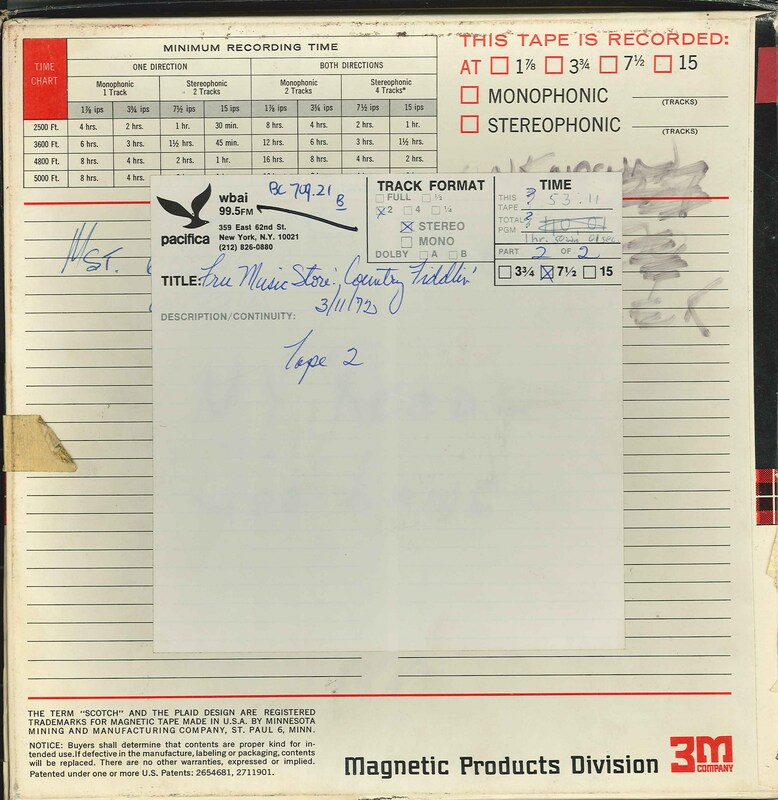 This recording was formerly cataloged as BC0709.21B. Sound levels fluctuate throughout, audio drops out at 00:12:07.